AAUW NC is a member of the NC Voters for Clean Elections coalition. They are having a celebration of their 10th anniversary and their annual meeting on Thursday, Dec. 10. 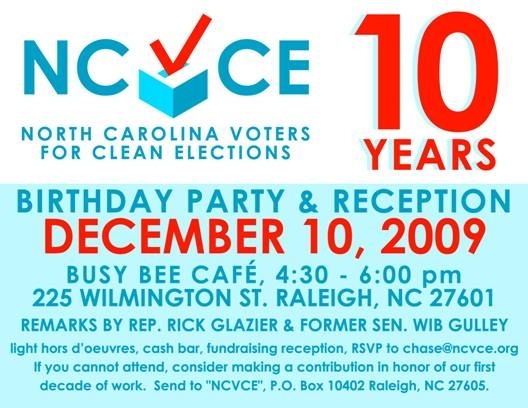 Both events will take place Dec. 10th at the Busy Bee Café in downtown Raleigh. The annual meeting will be from 3:30-4:30. The reception will be from 4:30 to 6. They are encouraging coalition partners to stay for all or part of both. If you’d like to attend representing AAUW NC, please coordinate with Elaine Ostrowski (contact info).